Seefeld is a little bit different from other Alpine ski resorts – it’s a popular winter destination easily accessible from the UK that takes its cross-country skiing seriously. Part of that is due to its history (the location for the Nordic events in the two Innsbruck Winter Olympics); part is due to location (an altitude of 1200m on a relatively flat plateau); and part is due to the future (the World Youth Olympics in 2012 mean that much work is being done to modernise biathlon and ski jumping facilities, as well as the constant work on the snowmaking for cross-country trails). So, while it is not the kind of destination for those who relish hut-to-hut treks over the Scandinavian wastes or the discovery of remote Swiss village trails, it’s a good option for those who fancy a quick enjoyable break on the trails or who have to placate other family members who are looking for activities which don’t involve skinny skis. There are just under 300km of trails which are fairly evenly split between the two cross-country styles (154km classic, 121km skating). Some of the trails have snowmaking on them – although the relatively high altitude means that this is not normally needed – and there is even an illuminated evening trail in Seefeld. Experts will be looking at the Wildmoos area between Seefeld and Leutasch with some lengthy black loops through the forests which can be combined together in different variations. But the jewel in the Seefeld plateau’s “langlauf” crown is probably the Leutasch valley, with a mixture of intermediate trails leading all the way to the German border along the base of the Wetterstein ranges. Accommodation is available all over the plateau – the biggest centres are Seefeld itself or Weidach over in the Leutasch valley. Package holidays are available through Innsbruck airport only 30 minutes away from the plateau (Inghams are the main UK operator with flights from Leeds-Bradford and Manchester) but it is relatively easy to make your own way. Take a bus from the airport into Innsbruck railway station and a direct train up to Seefeld or Scharnitz (or cadge a paid transfer on a travel company bus from the airport) or alternatively fly into Munich and take the main rail line down through Garmisch-Partenkirchen (around 3-4 hours including change in Munich). Hire shops with cross-country equipment are plentiful and there are ski schools with specialist cross-country sections that can help improve technique or introduce new skiers to the sport. Outside the cross-country trails, the Seefeld plateau has four smallish downhill skiing areas suitable for beginners and intermediates, as well as a good network of cleared walking trails and some excellent snowshoe routes. The relatively proximity of Innsbruck means that it is also easy to do some sightseeing down in the Inn valley. 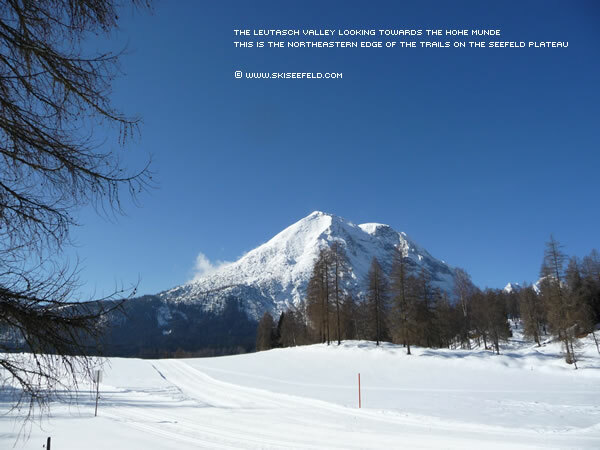 This cross-country skiing article has been written by Steve Rout from the Ski Seefeld website . 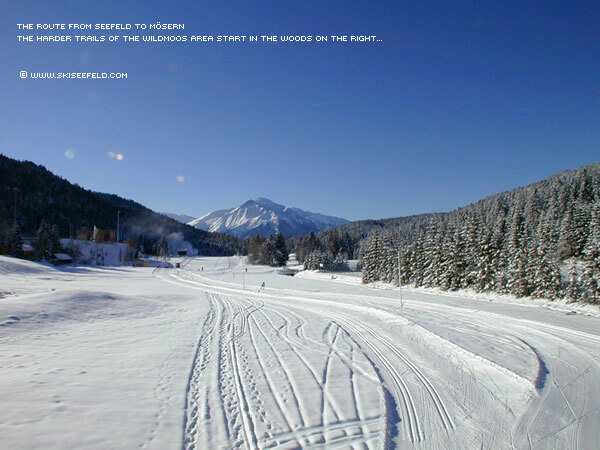 More detailed information about the Seefeld cross-country skiing options can be found here.